We got them at World Market a few years ago and they were inexpensive. They’ve held up well, they’re super comfy, but they’re clunky as heck to travel with for sure (16 pounds each!). 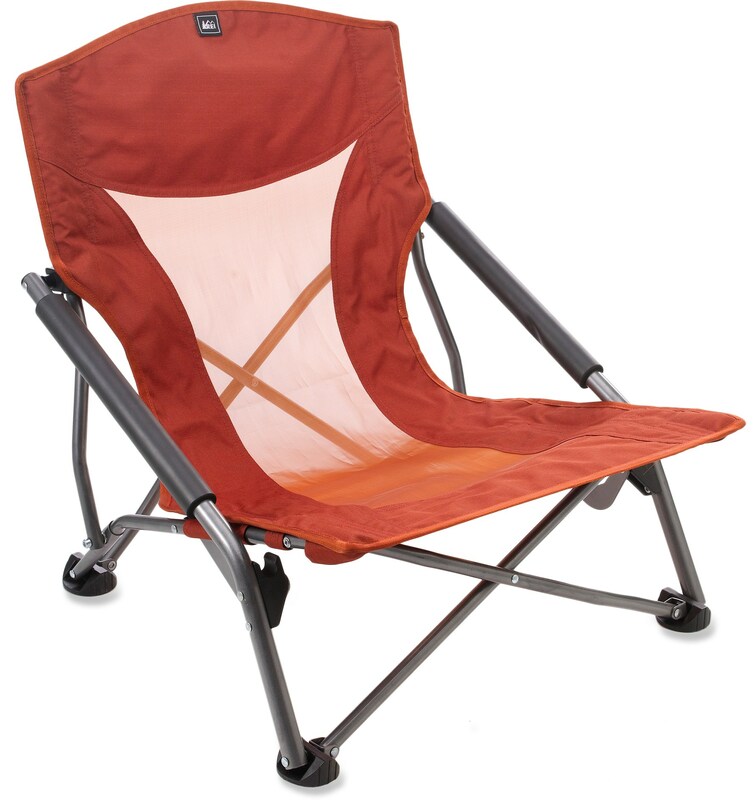 The Zip Dee red ones we have are much easier to deal with, but no high backs, no drink holders, and they’re standard height, not low beach chair height like these, which I really like. They come in a bunch of colors, are really lightweight (5.3 lbs), comforable (I sat in one, they’re great), and they fold up into that bag for a really compact and space-saving option. Originally designed in 1984 by a motorcycle rider, they’ve now gained a fairly intense and cult-like following. They retail for $139 and there are add-on options such as drink holders, leg extensions (if you prefer your chairs tall), and even a cute little side table to match. If you’re tight on space and you want some comfy chairs, I’d highly recommend these Kermit chairs. They’ve got a ton of different colors and patterns to choose from, too, if you feel like a splurge. Not sure how comfotable the sling chair design would be sitting at the campfire, though. They look more like sun chairs to me. If none of these really feel like the perfect chair and you want to match that fabulous fabric you got for your custom curtains, you can always try making your own! Here’s a cool little tutorial I found for making your own wooden folding sling beach chair. I know there are a ton of other types of camping chairs (especially the Camping World, WalMart, Sporting Goods, REI offerings). I really like my chairs to be comfortable AND stylish, low for the campfire, reclinable, with drink holders (so you don’t always have to pull the little table out). I want chairs that will fold up nice and flat for transporting, chairs that will last and withstand a bit of sun and rain, and I always try to find all of this in a chair that’s not the same as what anyone else has (I know, tall order). I may have found a better-made, lighter weight version of the chairs we have now and I’m tempted to upgrade pretty soon. If you have any other favorites you feel like throwing into the pot here, feel free to add the links in the comments section.